Wicked Cakes of Savannah was opened in January of 2015 as the vision of local baker Abby Longwater. Wicked Cakes of Savannah offers made from scratch cakes, cupcakes, brownies and bars, cookies and other specialty treats. The storefront offers an array of these desserts, with our flavors changing often. If you are looking for custom wedding cakes or cupcakes, contact us or click the Weddings link for more information. 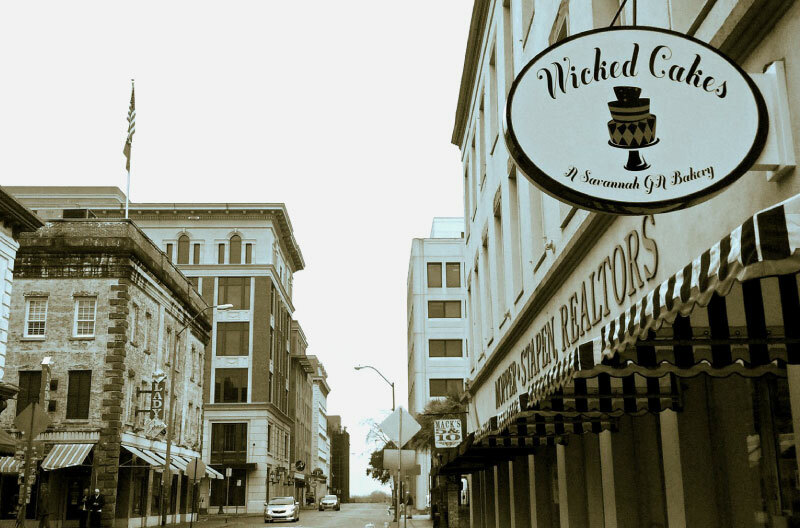 We are located at 38 Whitaker Street in the heart of beautiful downtown Savannah, Georgia. My name is Abby Longwater. I am a Savannah native and have been making cakes for over 10 years, starting from my home kitchen, making desserts for friends and family, to today, owning my own bakery at the age of 25. I am a 2007 graduate of St. Andrews School, and have a Bachelor’s of Business Administration from Georgia Southern University. I have since worked as a professional baker and have always dreamed of owning my own storefront. At the end of 2014, an opportunity came along to begin my own bakery, and I decided to take it. I have completed multiple classes in Sugar Artistry with celebrity chef Nicholas Lodge and although 90% self-trained, I have had professional training and mentoring as well. Now, I look forward to serving the people of Savannah with fresh, homemade treats that are wickedly delicious!